There is of course infinite variation on any of these shapes. 1: Straight Back. This has a wide curved edge towards the bottom of the blade. Suitable for all lengths from small to larger knives. The strong shape is also ideal for chopping, rough cutting. The flat unsharpend top side allow it to be batoned easily. Using your thumb on the same unsharpen top section near the tip allows for controlled fine cutting. The sweeping curve is well suited to skinning, slicing and general cutting. The tip is oriented to the top of the blade but still allows it to be easily used for drilling. An excellent all-rounder shape for hunting, survival, and general camping. 2: Drop Point. Similar to the straight shape except with the tip lowered approximately quarter-way of the width of the blade and with a convexed shape. Also suitable for all blade lengths. The lowered tip allows for easier drilling and piercing during thrusting movements. The convexed top allows the tip to be sharp while remaining very strong. If the blade has a heavy and thick construction this will allow the tip to handle heavy hole punching, digging and prying. The curved edge is only slightly shorter than the straight back version but performance is almost as good for skinning and general cutting. As an all-rounder this shape is probably the most versatile. This shape is currently the most popular selected for a survival knife. 3. Curved Trailing Point. 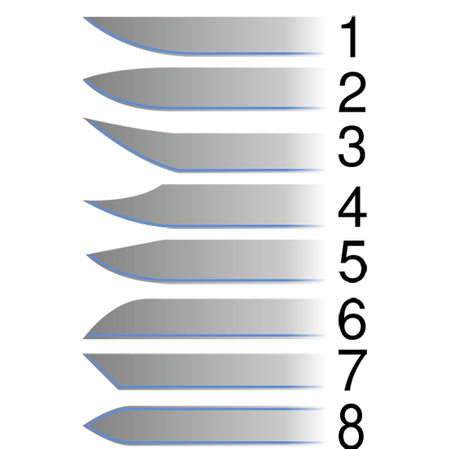 The tip is well above the top straight edge to allow a longer sweeping curve to the edge. Suited for medium sized blades. This shape is more specialized towards a skinning style blade. This is not as well suited for drilling or punching holes due to the off-set tip. This blade style is popular with hunters and butchers. 4. Clip Point. Similar to the drop point except with a downward concave shape towards the tip. The tip appears to be ‘clipped’ away giving rise to a sharper tip. Designed to allow the tip to reach smaller confined areas while skinning or carving. Sometimes the concave clip is sharped to provide more versatility for forward push cutting. Typically seen on the Bowie knife designs. A versatile and very popular design since Jim Bowie designed it in 1830. In spite of the popularity the tip has less metal hence will not be as strong as a drop point blade for heavy piercing. 5. Straight Clip Point: A variation of the clip point. It has has neither a convex or concave top section. Instead a straight line from the tip to the top of the blade. The tip on the straight clip point isn’t quite as strong as the drop point but is a good compromise between the drop and the clip point. Note, it will drill and pierce slightly better than the drop point. This style is also a great all-rounder and is very popular as well. 6. Sheeps Foot: Resembling the hoof of a sheep’s foot, this has a flat straight-line cutting edge and a downward curving tip. Similar to the straight back shape but with the opposite side of the knife sharped. The sheeps foot blade is good for slicing and cutting. It is especially good in giving you a clean cut on a flat cutting surface. With virtually no sharp point at the tip, they are poor at drilling and digging. Also with little to no belly on the main edge they are not well suited for skinning (but not impossible). eg, Box cutter utility knife. 7. Tanto Style: This chisel-like shape is the same used by the traditional Japanese sword makers. Like the straight back blade but with a straight drop at an angled to the bottom to the blade. Like the straight back this is also a very strong shape. There are actually two sharp tips to this style. One on the top and bottom of the blade. The forward angled straight edge makes a very strong and efficient stabbing tip while the second tip on the bottom makes a great cutting or slashing edge, similar to the sheeps foot. Hence, the style is perfectly suited to the Japanese Katana and Wakizashi. With no curved belly to the blade the shape is not well suited to skinning. This makes the tanto style a great combat blade but not so great general outdoor knife. 8. Spear Point: This has an symmetrical or similar curve on both the top and bottom of the blade. The tip will be near the mid-way position. If the bottom curve only is sharpened then the performance is similar to the drop point style. It’s a slightly better driller shape but it will have slightly less curve or belly for skinning. It is an excellent all-rounder shape for general cutting, punching holes, digging and batoning. The shape is slightly lighter than a straight back style so it will be slightly less efficient for chopping. However, on a larger knife it will still do a respectable job. This shape is best suited to small to medium length blades. A versatile and very popular style. If both the top and bottom curve are sharpened then you can no longer place your thumb along the top side for fine controlled tip cutting. Also batoning will be less efficient since some of the impact energy, instead of being transferred to the blade, will be absorbed in the chopping action on the baton itself. Slicing and cutting will remain the same. In fact with two edges the blade will last twice as long for general cutting before it will need to be sharpened. The double edge is excellent for drilling, and more importantly, stabbing. Hence, this style is usually seen on many combat blades. eg, the SAS dagger.